Retailers attending Interbike next week will have the unique opportunity to meet Chris Carmichael, Lance Armstrong's personal cycling coach and founder of Carmichael Training Systems. Carmichael successfully coached Armstrong to 7 consecutive Tour de France victories and last July's remarkable third place comeback finish. 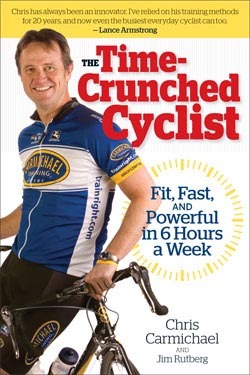 Carmichael will launch The Time-Crunched Cyclist Tour Energized by GU during a book signing event on Thursday, September 24th from 5-6 p.m. at the VeloPress/VeloNews booth # 2139. The event will include free beer and samples of the newest products from GU Energy Labs including Chomps Energy Chews and Roctane Ultra Endurance Energy Gel. Thursday, September 24th, 5-6 p.m.
Lance Armstrong's personal cycling coach, Chris Carmichael, released an innovative approach to training, just after 7-time Tour de France winner Armstrong took third place in his comeback Tour. The Time-Crunched Cyclist: Fit, Fast, and Powerful in 6 Hours a Week presents a new way to achieve competitive fitness and power without the impossible time demands of traditional training methods. The book is now available in bookstores, bike shops, and online. The founder of one of the most successful endurance coaching businesses, Carmichael noticed that many busy cyclists are unable to make performance gains using conventional training methods. They simply don't have enough time to train the way cyclists have for 30 years. Drawing on his 20 years of experience working with Armstrong and busy career professionals, The Time-Crunched Cyclist shows cyclists how to build fitness on a realistic schedule by emphasizing the power of high-intensity interval workouts. In just 6 hours a week, cyclists can develop the snap, endurance, and strength they need to push the pace in the local group ride, have fun and perform well in local races, or tackle challenging century rides. The Time-Crunched Training Program starts with the CTS Field Test, a proven test for establishing a cyclist's personal training intensities. Each of the book's four training plans features a complete set of workouts including intervals and instructions. Carmichael also explains how to fuel for high-intensity training and adjust riding to take advantage of new power and speed. The book provides a time-crunched strength training program and supplemental endurance training blocks for cyclists whose schedules unexpectedly clear. Complete with training plans, case studies, nutritional guidelines, and success stories, The Time-Crunched Cyclist is the new training approach that working professionals and parents have been waiting for. Cycling is more fun when you are fit, and now great fitness is achievable for cyclists who thought their best performances evaporated along with their free time.